Rocksteady’s Arkham trilogy may be finished, but it’s not going away any time soon. Not only is there a season pass for Arkham Knight (which costs as much as – or more than – many people will have paid for the full game) which provides DLC for six months after release, there’s also this official and lavishly produced art book, which covers all three games. With an RRP of twenty five notes, it costs as much as you could easily find Asylum and City for combined. So the simple question is: Is it worth it? This hefty hardback tome features over 300 pages and the obligatory dust jacket, making it a nice addition to your coffee table where you can panic about spilling your Batcoffee over it. Whereas something like the Resident Evil Revelations art book which we reviewed last week is annotated, this features much meatier commentary throughout, building a consistent narrative and incorporating quotes from members of the team constantly. The text of the book is by Daniel Wallace. Wallace has experience with sci-fi and comic books including, most relevantly here, The Joker: A Visual History of the Clown Prince of Crime, and Batman: The World of the Dark Knight. He doesn’t have a loud and enthusiastic fan’s voice though, quite the opposite; the author here simply melts into the background, allowing the game, its art, and the people who made it to do the talking. This is clearly an intentional and understandable decision, but it leaves the writing rather dry (more on which soon). Still, a book with the word ‘art’ in the title is going to place emphasis on pictures, and that’s exactly what this one does. Virtually every page has at least one picture, with the most detailed given a page (or, sometimes, two) to themselves in order to do them justice. Thankfully, not a single piece of art has been printed at a frustratingly small size. There are a handful of in-game renders, and a selection of images that were produced especially for marketing, but the vast majority of art on offer here you won’t have seen before. There’s a treasure trove of concept art for all three games, including a few peeks at what might have been in terms of incomplete or unused designs for characters and environments. Respect must be given for crediting the artist responsible for each picture too, though there are a small number of exceptions where the person/persons responsible aren’t identified by name; especially, for some reason, much of the concept art for Arkham Knight (some of which was outsourced). It would be criminal – and not in a fun/murderous Joker fashion – to discuss this book without remarking that, although all artists who worked on all three games are clearly immensely talented, John Gravato is surely the star of the show. Some of his work on show here would not look out of place in an art gallery. In fact, the greatest criticism that can be levelled at this book is that (through no fault of those who compiled it) there isn’t more of Gravato’s work on show, as it seems that he was only brought in to help with Asylum. On a related note, it’s a shame that no prints or posters are included. As the art on display covers all aspects of all three games, there is of course – as with any art book – the issue of spoilers to consider. The most significant spoilers to bear in mind are the endings. The final boss of Asylum and the controversial ending to City are revealed, as well as – inadvertently – the identity of the Arkham Knight. This isn’t stated explicitly, so it was perhaps a conscious decision to omit it; but there’s what seems to be an unintentional hint in the commentary, and the true identity of the Knight is written in capital letters on one piece of concept art. D’oh! The book doesn’t concentrate solely on art though, and this is where things start to get a little fuzzy and incoherent. Issues of programming, combat development, and general game design are touched upon in the commentary. There’s even two pages talking about the sounds of the series; nothing wrong with that. The issue is that this opens up the opportunity to address common concerns and questions that fans of the series have, and this opportunity is never taken. For example, while the aforementioned radical ending to City is explained within the context of the Arkham game series (or “Arkhamverse” as it is regularly referred to), it’s not even acknowledged that some fans were unhappy with the decision, or that it marks a major departure from Batman canon. Also not acknowledged is the existence of Arkham Origins. 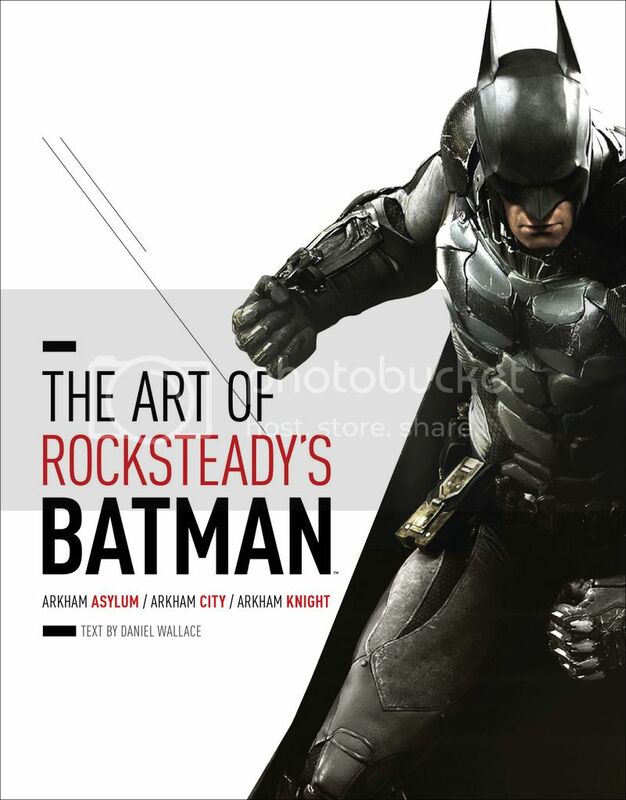 Yes, it’s probably best to forget that game exists, and it wasn’t of course developed by Rocksteady; but it really does feel rather odd to see the book constantly referring to a consistent Arkham world while carefully avoiding ever mentioning Origins. In fact, an early quote from game director Sefton Hill (“We weren’t interested in exploring Batman’s origins”) could be seen as a subtle, catty shot across the bow. Is it? We’ll never know. While quotes from a selection of the development team sometimes throw up an interesting fact about the development or design process, don’t expect any interviews with anybody involved not permanently employed by Rocksteady. While Paul Dini’s involvement with the Asylum and City scripts is openly discussed, for example, there’s not so much as the briefest quote from him. Also, although creating versions of Batman and the iconic villains specific to the “Arkhamverse” is discussed at length, the actors who brought them to life (such as Mark Hamill, Kevin Conroy, and Tara Strong) aren’t even named, let alone interviewed. The final criticism we have – and this is all ultimately trivial stuff – is that, as mentioned earlier, the writing is somewhat more aloof than we’d like. Unbridled fan excitement would be messy and off-putting, certainly; but hearing Rocksteady employees geek out in interviews at winning the Batman license at the time, we suspect, contributed to the impressive sales. On the rare occasions that anybody is allowed to show enthusiasm here, it’s extremely muted. Overall, it reads like a company prospectus being presented to a publisher during contract negotiations; albeit one illustrated throughout with outstanding art. And there, you see, is the rub. Most of the pictures will have you ogling them at length, drinking in the detail, and – yes – sometimes gaining a new angle of appreciation for the relevant game. Anybody who loves comic book and/or Batman art in general will find plenty to entrance them here, too. And even though we complain about the writing style, not once over the hundreds of pages did we feel our interest slipping while reading the text. The writing is businesslike (and the quotes sometimes a little too PR-like) yet fully engaging, and the overall structure of the book has been carefully designed to ensure that the text is always relevant to the art which surrounds it (though the Penguin is in one caption misidentified as the Joker). If you love everything Arkham – or everything Batman – this is well worth the asking price.